When you’re on the trails, track or streets, you don’t want to have to be worrying about your feet. Finding the right pair of running shoes can be considered an art form in some running circles. There are many things to consider when selecting the best kicks for all terrains and seasons. However, it’s also important to understand those expensive Nike or Adidas shoes are not always the best option for you. Here are some other factors to consider when thinking about buying a new pair of running shoes. There are many qualities that make up a good pair of shoes, but if they don’t fit your feet correctly, you’re already off to a bad start. Don’t assume you know your shoe size — our feet grow over time, and not every type of shoe fits the same — when picking out your next pair of kicks. Sizing is not always accurate, and you may need to adjust by moving a half size up or down. This is especially true when the shoes are made by a company outside the United States. In fact, European shoes don’t always translate into our customary American sizes. Another thing to consider is that each foot is like a snowflake — they’re all shaped differently. Find a shoe that has a moldable sole. This allows the shoe to take form around your uniquely shaped toes, heel and arch, enabling you to have adequate support in the places your foot needs it most. 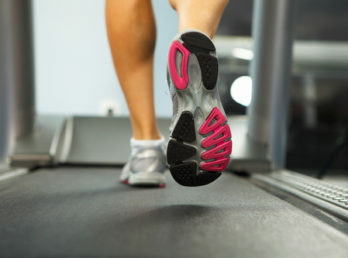 Unless you’re running indoors on a track or treadmill, you’ll want to consider the tread on your shoe to accommodate the weather and season in which you’re running. The last thing you need is to find yourself not sticking to your running surface and wasting energy on keeping your feet planted upon each stride. If you run outdoors, you may find yourself on terrain that requires more traction, like in the mud or snow. Take a look at some shoe companies that have upped their traction game by partnering with tire companies. Adidas, in particular, has a few options in which to choose. You’ll find your running times will get faster as you’re better able to push through that mud and snow. If you run in warmer weather, you may want to look for a shoe that allows for more breathability. There are a few brands that sell shoes with a meshy top surface, allowing for more airflow and the less likelihood of getting sweaty feet while out running. Purchasing new running shoes can sometimes put a strain on your pocketbook, but it doesn’t have to be that way. Research shoe stores online and read user reviews to help you gain an understanding of what to expect out of your potential next pair. Head to your local shoe store and try on the pair you may have had your eye on online. While you’re there, try on several pairs so you can get a feel for what you want and don’t want out of a shoe. Local retailers tack on service fees and other price hikes that you won’t find online. So once you find that dream pair, order them online and save yourself some hard-earned cash.